I have been trying to get back in the swing of things with crafting since the distractions of some things going on back home with my family along with then being sick for 3 weeks :( I think you will finally start seeing me a bit more in blog land and posting some fun projects. Thanks for all your support the past couple months~it's meant a lot to me that you've hung in there with me! Also, be sure to stop back tomorrow as I have some exciting news to share with you! 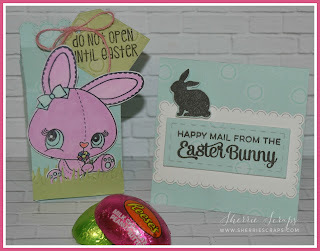 Today, I have a fun and simple Easter treat and card to share today. 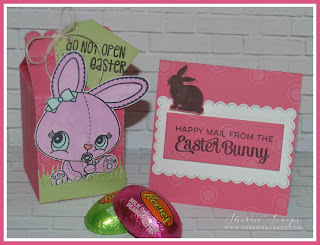 I decorated this fun little milk carton with this sweet little bunny from Jaded Blossoms Honey Bunny stamp set. I colored it with copics and popped it on with foam adhesives. The grass is from Jaded Blossoms Spring Dies (version 2). The sentiment is stamped with Jaded Blossoms Bunny Mail stamp set onto a Mini Tag Die 2 and then tied on with jute string. Oh Sherrie, these are the sweetest Easter gifts!! The milk cartons are so adorable!! I love the sweet bunnies in the grass!! You colored them perfectly!! The cards are so beautiful!! I love the silhouette images of the bunnies!! So fabulous, my friend!! Thank you so much for playing along at DL.AT!! Adorable treats! I just love those little milk cartons, they are so super cute! The bunnies are just the sweetest! I would love to go on a retreat, that sounds amazing! The milk cartons are just adorable, and I love the tiny cards from the Easter Bunny. The design is so sweet and versatile. Glad you had fun at the retreat and that your family is recovering from so much illness. Thanks for joining us at Jo's Scrap Shack. I bet your scrap retreat was so much fun! I would be guilty of talking more than crafting I'm sure...lol! I love your sweet little milk carton treats. Those bunnies are super adorable! Sounds like the Scrap retreat was a blast! You know you're suppose to talk a lot and eat lots of goodies and get very little done..... RIGHT? At least that's how it always was for me! LOL I'm just glad that you're feeling better and hoping things with your Dad are going well too... :) Your projects are ADORABLE! I LOVE that Bunny from JB... it's on my wish list... so are many things in fact! hahaha! YES our Birthdays are pretty close... yours is the 12th, mine is the 18th! EEK it's our Birthday Month!!!! :) Have a great day! HUGS! Sherrie your creations are wonderful! I love the decorated milk carton, I'm sure there chocolate in it! Thank you for sharing with us at LRW. These are just adorable Sherrie, The retreat sounds like fun. I'm glad to see you sharing some projects with us. I look forward to more and glad things are settling down so you can craft more. Prayers going up for you and your family. Glad you had a good time at the retreat. Your Milk Carton and Cards are so cute. I made some 3x3 Cards and are on my blog. Great minds think alike. Ha! Love that Bunny. Happy Day to You! This is so sweet. Beautiful creations! What a adorable Easter set!! Love the sweet little bunnies!! Love it!! Have a great day. This is so very nice. I love these creations. Adorable set!! The JB bunnies are sweet. 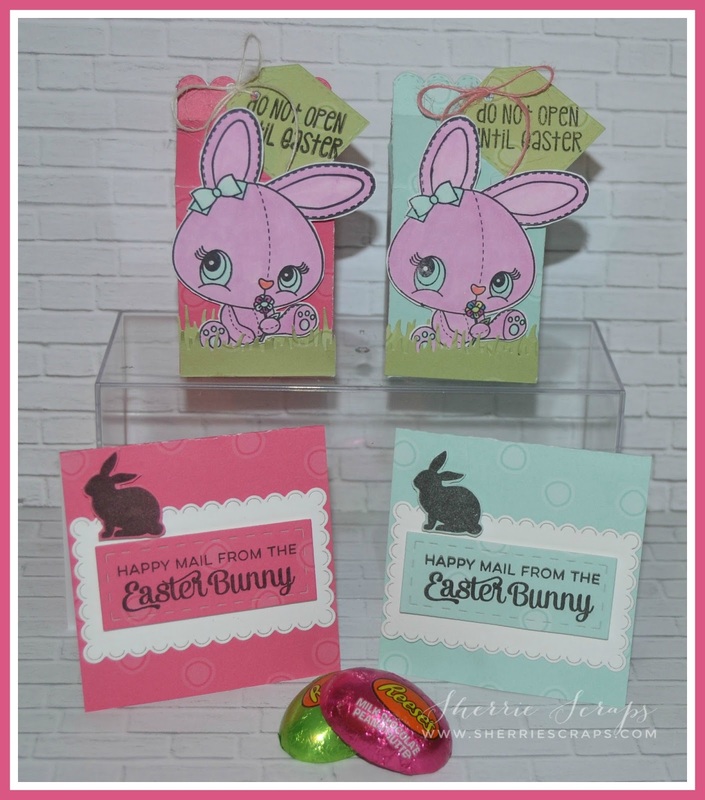 Adorable cards and super fun treats!! Awesome job my friend! Beautiful work. Thank you for Joining us at Scrapping4funChallenge and waiting to see next time. 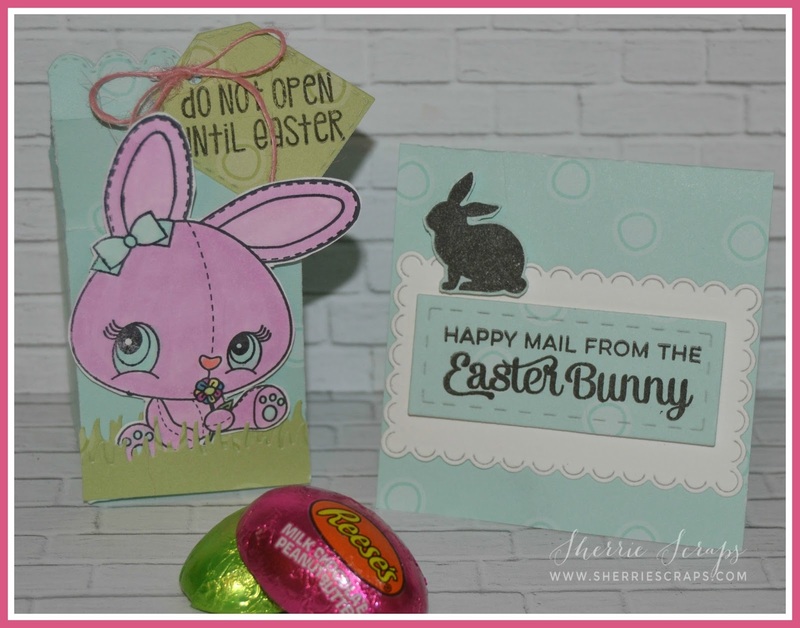 Very cute Easter goodies. Thank you for joining us at Jo's Scrap Shack. Really cute!! Thanks for sharing at PDE Linky Party. These are so cute!! Those pink bunnies are adorable!! I love those little Reese's eggs too. What a nice treat for your boxes! So glad you're doing so much better! SUCH a sweet Easter treat set! Omgosh! LOVE!